Egyptologist and Bloor West resident Gayle Gibson is retiring from the ROM after 25 years. Famed Egyptologist Gayle Gibson retired from the ROM just last month after 25 years bringing ancient Egypt alive for tens of thousands of school children and lifelong learners alike. The long-time Bloor West resident will be missed among expert staff at the downtown museum. With a new tour to Egypt in the works for January 2016, Gibson is gearing up for her first post-retirement talk in May – women’s month – celebrating the life of one of Egypt’s greatest queens: Hatshepsut. On Tuesday, May 5 at 6:30 p.m. Gibson will be joined by another Egyptology expert Dr. MaryAnn Pouls Wegner of the University of Toronto, who has recently made some profound archaeological discoveries about Hatsheput in Middle Egypt. ‘Discovering Hatshepsut’ is being presented at the Alliance Francaise at 24 Spadina Rd. Gibson has become an internationally renowned mummy and coffin expert, appearing in numerous history documentaries over the years, including Museum Secrets, Nova: The Mummy Who Would be King, and last year’s BBC One program: Tutankhamen, the Truth Uncovered. 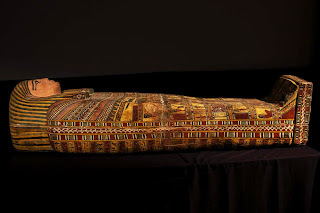 Her name also made the news this past fall when she discovered the name of a female mummy – ‘Nefer-Mut’ (a.k.a “Justine”) – who had lain unidentified in the ROM museum vaults for decades. 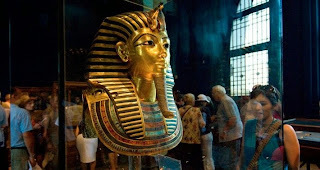 She also identified that peculiar Egyptian Mummy in the old Niagara Museum back in the 1990s as none other than Pharaoh Ramses I, and helped to get him back to Egypt. Breathing life into the ancient Egyptians is what Gibson does best. A consummate storyteller, she has not only led countless tours of the ROM’s collections to school groups but has also taught some of the ROM’s best-attended courses on hieroglyphics and ancient Egyptian history. She has also played a key role as media expert and spokesperson on all things Egyptology. She was deterred from her dream profession by a guidance counsellor who dismissed it as ‘stupid’ and not something that could ever make her a living. So instead, she went on to become a drama and high school teacher for the Chatham-Kent, York, North York and Toronto boards of education. It was only after her son was born that she rediscovered her true calling and returned to U of T to finally attain an MA in Egyptology as a mature student. But that’s all history now. After 25 years, she is immensely proud of the institution and its many contributions to historical preservation, study and education. When the Niagara museum was sold in the late 1990s, Gibson was consultant to the buyer William Jamieson and helped sell the coffins and mummies to the Michael C. Carlos Museum of Emory at Atlanta. It was in Atlanta that the positive identification of the mummy as Ramses the I was made, and the great Pharaoh was triumphantly returned home to Luxor. Gibson will be stopping by to pay her respects to Ramses during her January 2016 tour to Egypt. 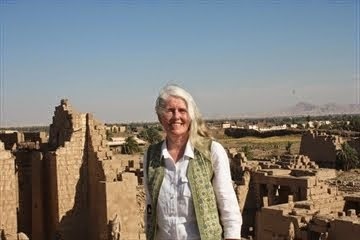 With more than 20 trips to the Egypt under her belt, she is certain to bring an insider’s view of all the pyramids and temples, along with the rarely visited sites of Middle Egypt. With its vast and diverse geography, ancient civilization, Red Sea coastline, and safari potential, Sudan can be considered one of the untapped frontiers of Africa’s tourism industry. Though the industry has been held back by a lack of infrastructure and outside investment, as well as travel alerts in some Western countries, increasing inflows of tourists from the Middle East and a concerted development drive from the Sudanese government suggest that this is about to change. This article will highlight the main features of this market’s potential to develop into a regional tourism hub. Sudan is the third-largest country in Africa and sixteenth-largest in the world. The country is situated in northeast Africa, with an 853-km coastline bordering the Red Sea. Both the Blue and White Nile rivers run through much of the country and the two intersect near the capital Khartoum to form the legendary Nile that flows through Egypt to the Mediterranean. Sudan is a land of geographic extremes and the topography varies from sandy desert to grassland savannah, jagged coastlines, and tropical forests. This biological and geographic diversity makes Sudan a truly unique place to visit for any aspiring naturalist or physical geographer. Sudan has the potential to become a premier destination for scuba diving in North Africa. From Port Sudan divers can explore the most untouched waters in the Red Sea, including the famous Shaab Rumi coral reef where the world-renowned biologist and explorer Cousteau once conducted his experiments. The reef is home to an abundance of coral species, reef sharks, barracudas, bumphead parrotfish, and black and white snapper. Sudan’s Red Sea coast also offers some of the best wreck diving in Africa. Multiple wrecks, including the Umbria and Blue Belt, can be viewed in Sudanese waters. The Umbria wreck dive offers scuba divers the opportunity to view a World War II wreck. The ship was scuttled by the Italian Navy in 1940 to avoid it being captured by British/Sudanese forces. The ship’s cargo included 350,000 bombs and other arms bound for Axis forces in Eretria. The Umbria is rumoured to be one of the best wreck dives in the world due to its size and shallow depth. Sudan also offers an array of safari destinations for tourists looking to explore the African savannah. Sudan’s Al Radom and Dinder National Park’s play host to one of the largest animal migrations on the planet. Each year, in the dry season (November to March), herds of white-eared kobs, tiang antelopes, mongalla gazelles, elephants, buffalo, zebras and other ungulates trample miles of dry plains in search of water and food, all in tightly-clustered groups up to 10 kilometres long. Sudan has a rich and ancient history dating back to the eighth millennium B.C. The country is home to multiple ancient excavation sites, pyramids, and tombs, one of the largest being the Archeological Sites and Pyramids of Meroë, which is located just 2.5 hours north of Khartoum. This ancient city was the capital of the Kingdom of Kush from 800 B.C. to 350 C.E, a powerful civilization that derived its wealth from a strong iron industry and international trade with Ancient Egypt, India, and China. The Meroë Site is marked by more than two hundred pyramids in three groups, many of which are in ruins. They have a distinctive size and shape that is characteristic of Nubian-style pyramids. In June 2011, the Archeological Sites of Meroë were listed by UNESCO as a world heritage site. In addition to Meroë there are multiple other historical attractions, including the ancient Gebel Barkal site, the Amun Temple, the Wadi Al-Ubayyid Cave and many others. Sudanese culture merges the practices and rituals of about 578 ethnic groups, communicating in 145 different languages, and in many ways the country represents a microcosm of Africa as a whole. Most citizens identify strongly with both Sudan and their religion. Since the arrival of Islam in the country as early as 650 A.D., the teachings of the Koran have had a great influence on the people of Sudan. The vast majority of Muslims in Sudan adhere to Sunni Islamic teachings from the Maliki School. However, Islamic practices in Sudan have been deeply influenced by Sufism. 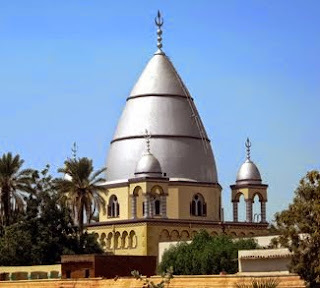 This long and diverse religious tradition, and the cultural sites that come with it, have helped to make Sudan into an appealing tourist destination in the Muslim World, particularly among travellers from the Middle East. Sudan’s tourism sector is far less developed than other African tourism hotspots like South Africa and Kenya, making it an ideal place to invest. According to remarks made in 2013 by Tourism Minister Mohamed Abdul-Karim Al-Had, Sudan’s tourism revenues in 2012 were estimated at around USD 600 million. In 2013, Sudan hosted over 5 million tourists, and that number is expected to triple over the next decade. The government has also taken steps to streamline the regulatory environment and remove previously high tax burdens on the tourism industry. The government has achieved this by amending the current Tourism Act to make the country a more attractive place to invest in and visit. They have enacted these reforms while at the same time placing an emphasis on conservation and the protection of coral reefs and marine ecosystems. Some Western nations have advised against non-essential travel to Sudan. Yet for the most part, other than some parts of the Darfur region and the South Sudan border area, the country is very safe. Sudan has low rates of crime and tourists are generally treated with respect. Note that alcohol cannot be brought into or purchased in Sudan. A Sudanese visa should be obtained in the traveller’s home country. Visas can also be obtained at the Sudanese embassy in Cairo. Visitors are asked to complete registration upon arrival, and those wishing to photograph certain sites in the country may require a permit. Sudan has all of the geographic and cultural resources needed to attract tourists; not just from the Middle East, but around the world. What’s lacking is the hotels and transport infrastructure to move them around the country comfortably. Yet solving this problem is only a matter of investment, and we are already seeing renewed investor interest in Sudan’s tourist industry. Once the necessary infrastructure is in place, there’s no reason to believe that Sudan couldn’t become a regional hub for tourism. Egypt's government says the tourists are back, but down on the street, in the souks and resorts The Africa Report heard a different story. If fewer Chinese-made pharoah heads are being sold, however, new tourism opportunities are opening up. On a warm sunny February day, buses steadily drop loads of tourists in front of the three Giza pyramids in Cairo. The ticket booths barely have a moment of respite – a sight that had become a rarity since the 2011 uprising that toppled autocrat Hosni Mubarak. For the country, whose economy and supply of foreign currency rely heavily on tourism, the past five years have been a struggle. Before the crisis, the sector provided directly for four million people, more than 10% of Egypt's work- force, and indirectly for an estimated 16 million. The government of President Abdul Fattah al-Sisi has recently funded campaigns to bring back tourism. Pro-government media propagate the idea that tourism is doing better since former defence minister Sisi became president in June 2014 and an air of stability returned. Despite an increase in bombings before the Egyptian Economic Development Conference in mid-March, many embassies have lifted their travel warnings and airlines are increasing their flights. "We learn about Egypt's antiquities at school. We all long to see them for real," says Paulo, an Italian businessman in his fifties who is in Cairo for a work trip. "This appeal will never grow old," he adds as he rests in a vast but still quite empty coffee shop after a visit to the pyramids. According to the waiter traffic is still not as intense as it used to be and the visitors who come on day trips from beach resorts do not stay very long in Cairo. In central Cairo, Tahrir Square has been renovated. Nothing remains of the tents that were once emblematic of the struggle during and after the Arab Spring uprisings that led to Mubarak's downfall. As clean as Cairo can be, the square is watched over carefully by swarms of traffic police and a couple of army tanks. A green roundabout sits in the middle of the square with a solitary pole waving the Egyptian flag. Even the much criticised martyrs' monument, which the government put in place at the end of 2013 to try and reconcile official and revolutionary narratives, has disappeared. Around the square, the Soviet-style government building The Mogamma stands alongside a mosque and the newly renovated Nile Ritz-Carlton hotel. A new, massive underground car park leads to the huge and pink Egyptian Museum, its en- trance lined with security and army trucks. 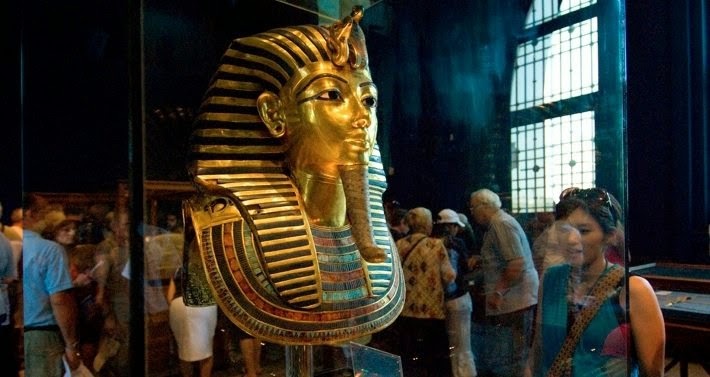 A pedlar in front of the museum who sells pharaonic-design embroidered purses says: "Since Sisi came into power, tourists started coming back." Once out of earshot of potential informants, the 39-year-old trader adds: "Before, I used to get new batches of purses several times a day. Not now." He has been selling for the past 25 years after his morning job as a civil servant. Behind the museum looms the darkened outline of the burned-out building that hosted Mubarak's National Democratic Party. In the distance flows the River Nile, carrying huge, half-empty catering boats and many small craft lit with fairy lights and blasting Egyptian electro-pop music. "As soon as Egypt stays out of the news for a while, tourists will flock back again," says Albert Samir, traffic manager of one of the biggest Egyptian travel agencies, Nicolas Tours. It plans trips across the country, from Cairo to the seaside resorts and the pharaonic sites in the south. "Before the political turmoil, our company used to have 3,000 to 4,000 tourists a month, now it is ten times less. For the next Easter holidays, the bookings are over a thousand, which is better, but nothing like what we had before." Over in Old Cairo close to the historic Citadel is the Khan el-Khalili souk. Packed with shops and kiosks, Khan el-Khalili is aimed squarely at tourists with its array of jewellery, antiques and souvenirs. Calls to prayer from the nearby Al-Hussein Mosque intermingle with the calls from the hawkers and merchants. Teapots and Islamic-designed bowls sit on shelves above shisha pipes, with maps of Egypt detailing the path of the river Nile on the walls behind them. At the tills, key rings, postcards, pyramids and mini pharaoh heads line counters in an attempt to lure customers into impulse buys. "[I] used to place orders every couple of weeks," says Eid Ahmed Ali, who keeps a shop called Arabesque, filled with plates and scarves made in Egypt and China. "Now I have been waiting for a year. Only the shops whose owners were from the area could afford to keep them open." Many hotels in downtown Cairo have also closed, hostel owner Dina Aboulsoud explains. When Dina's Hostel opened in 2009, it was renowned and busy. Recently, Dina has struggled to pay the bills. "I only kept the hostel open because it meant a lot to me," she says. Her latest venture is a large restaurant with her trademark arty atmosphere, which she took over after it closed in 2012. Its previous customer base was the tourists from the Marriott hotel who visited a nearby synagogue. Now Aboulsoud caters to Cairene hipsters. Menna Elhamy, an Egyptologist and tour guide, explains: "There are far fewer tourists than there were before 2010. The numbers have picked up in Sharm el- Sheikh but not really in Cairo and even less so in Aswan. In 2011, we didn't notice the slump immediately because many people didn't cancel their bookings. But in 2014 it was really bad." Former tourism minister Hisham Zaazou says: "Tourism is about image, we need to sell a dream. And the Western public is very sensitive to human rights issues. In 2010, there were 14 million tourists who brought a net profit of E£10bn, and in 2014 there were still only 10 million tourists." He argues that the country could return to pre-revolution figures in 2015. Another problem for Egyptian tourism is the decrease in tourist spending. Many tourism professionals complain that Russians, who constituted the bulk of tourists in resort destinations, are not among the highest spenders. But even the Russian flow is drying up as the country's economic crisis took its toll in early 2015. A one-hour flight from Cairo or a six-hour bus ride on a safe and well-maintained road is Sahl Hasheesh on the Red Sea in Hurghada, a symbol of Mubarak-era crony real estate development. There is no scarcity of water there and grass, trees and flowers brave the year-round heat. Most of the sandy coast-line hosts private beaches. Turquoise pools cascade inside concrete-walled and ochre-painted five-star hotels and residencies. Golf carts plough through private beaches and yachts are at the ready to take visitors diving and snorkelling. In Hurghada city, some of the resorts have known busier and more affluent times, but this is the age of inexpensive all-inclusive packages. Restaurants, shops, swimming pools, irrigated gardens and nightclubs are all found inside the resorts, leaving business owners on the outside struggling to find customers. A shopkeeper in town laughs: "We've had more Chinese tourists recently, but they don't buy much – most of what we have is made in China," including the so-called 'traditional' Egyptian belly-dancing costumes. With continuing economic woes in Europe the face of tourism is changing. At a gathering in Hurghada to celebrate the first Day of Arab Tourism in February, tour guides and travel agents watched a preview of an advert targeting Arab tourists. Amid the dancers, singers, shopping malls, ritzy hotels and flower-waving, dark-eyed women, the country's antiquities are hardly visible. Tourists from the Gulf countries make up 20% of Egypt's tourists. They have a well-earned reputation as big spenders. Special resorts and hotels have been built to cater to conservative lifestyles, even in seaside resorts, though when travelling alone some visitors enjoy distinctly unconservative pleasures. Looking further east, the Egyptian government is targeting one million Chinese tourists annually in the next few years. The Chinese government has sped up the process of allowing charter flights, making the North African destination more accessible. Objects include mummy coffins cut into pieces and sent to dealer via express mail. The coffin of an Egyptian woman buried some 2,600 years ago shows marks made by looters, who cut it into pieces for shipping by express mail. 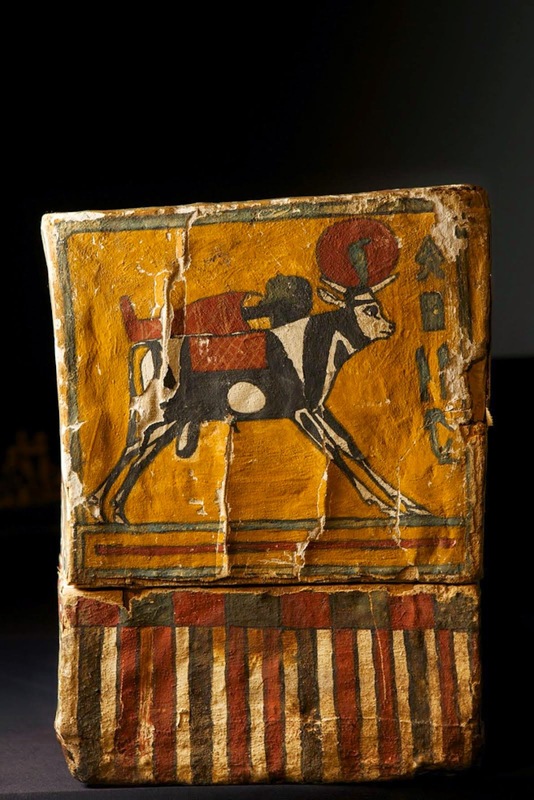 U.S. border agents intercepted the artifact, which is being returned to Egypt. The majority of cases of artifact trafficking investigated by ICE/HSI involve objects from the Middle East, where wars and general unrest have fueled the chaos that enables looters and smugglers to plunder an increasing number of documented and undocumented archaeological sites. 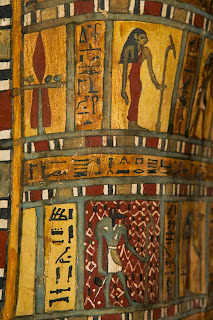 At a repatriation ceremony at National Geographic headquarters in Washington, D.C., Shesepamuntayesher’s brightly painted nesting coffins, decorated with gods and goddesses and spells from the Book of the Dead, shared the stage with Egyptian ambassador to the U.S., Mohamed Tawfik; Assistant Secretary of Homeland Security and ICE Director Sarah Saldaña; National Geographic President Gary Knell; and a host of other officials and special agents responsible for the return of more than a hundred artifacts that are believed to have been illegally smuggled out of Egypt. 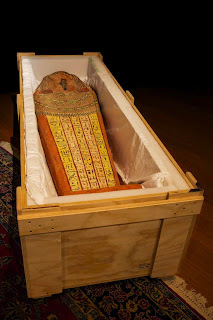 Other objects repatriated at the ceremony include a Greco-Roman sarcophagus from the time of Cleopatra; dozens of shabti figures, representing people who will assist the dead in the afterlife; and three 4,000-year-old wooden boat models, which were originally placed in tombs to provide the dead with a magical means of traveling through the underworld. The investigation, dubbed Operation Mummy’s Curse, began in 2008 when federal authorities were alerted to an artifact offered for sale by New York-based antiquities dealer Mousa Khouli, which appeared identical to an object in the hands of a man in a photograph accompanying a 2003 article on the looting of the ancient site of Isin in Iraq. The subsequent investigation revealed a complex network of dealers, collectors, and middlemen across the Middle East and led to the indictment of Khouli on multiple counts of smuggling and money laundering. Also indicted were Ayman Ramadan, whose company in Dubai sold items to Khouli, and Salem Alshdaifat, another U.S.-based dealer who allegedly facilitated purchases and had connections to Hassan Fazeli, an overseas source responsible for smuggling an Assyrian statue head from Khorsabad that was repatriated to Iraq last month. A Virginia-based collector, Joseph Lewis II, was also named in the indictment. One of Shesepamuntayesher’s coffins was located by ICE Special Agent Brenton Easter in the garage of Khouli’s home in Brooklyn, while the other two were seized at U.S. ports of entry. One of the coffins had been cut in three pieces to facilitate shipment by express mail. 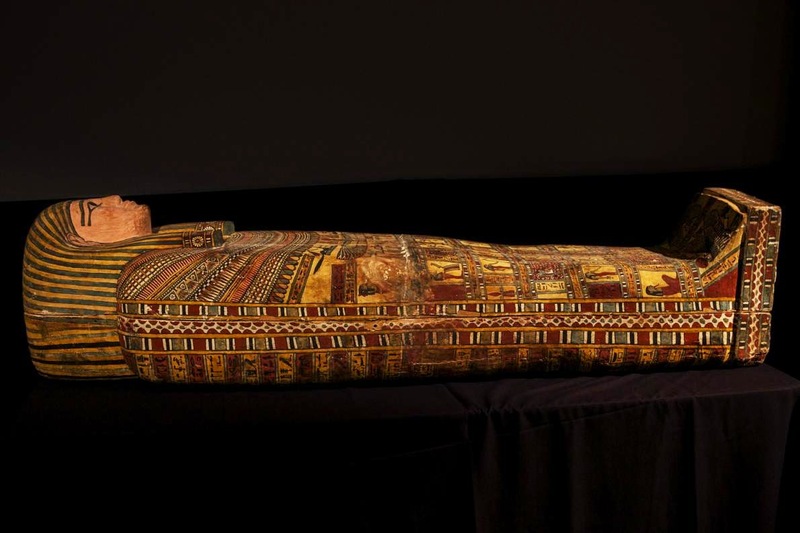 Traces of the linen that once wrapped her mummified body were found in the innermost coffin. Khouli originally faced up to 20 years on the charges against him and ultimately pleaded guilty in 2012 to smuggling Egyptian artifacts into the U.S. and making a false statement to government authorities. The government asked for a jail sentence of between four and five years. Khouli’s lawyer countered that in other cases where people were found guilty of smuggling cultural property, the most common sentence received was probation. Despite the prosecution’s argument that non-jail felony convictions for such cases had become “the cost of doing business,” Khouli was sentenced to six months home confinement, up to 200 hours of community service, and one year of probation and received a $200 fine. The collector, Joseph Lewis II, had all charges dismissed following a 12-month deferred prosecution agreement with the government. Ayman Ramadan, the source in Dubai, remains an international fugitive, while Salem Alshdaifat eventually pleaded guilty to a misdemeanor charge and was fined $1,000. 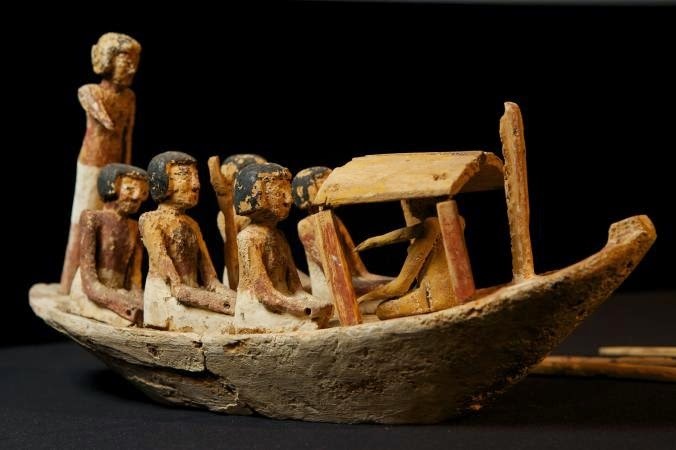 Federal agents seized some 7,000 artifacts, including three wooden boat models dating from 2000-1700 B.C. Following their convictions, Alshdaifat and Khouli continue to sell antiquities. Meanwhile, Shesepamuntayesher’s wild ride in the afterlife ends tomorrow when her coffins head home on an EgyptAir flight from New York to Cairo. 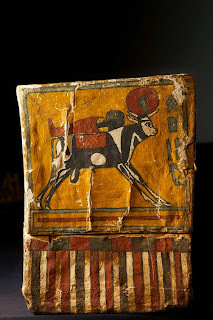 A detail from the foot of Shesepamuntayesher’s coffin shows the Heavenly Cow carrying a body. 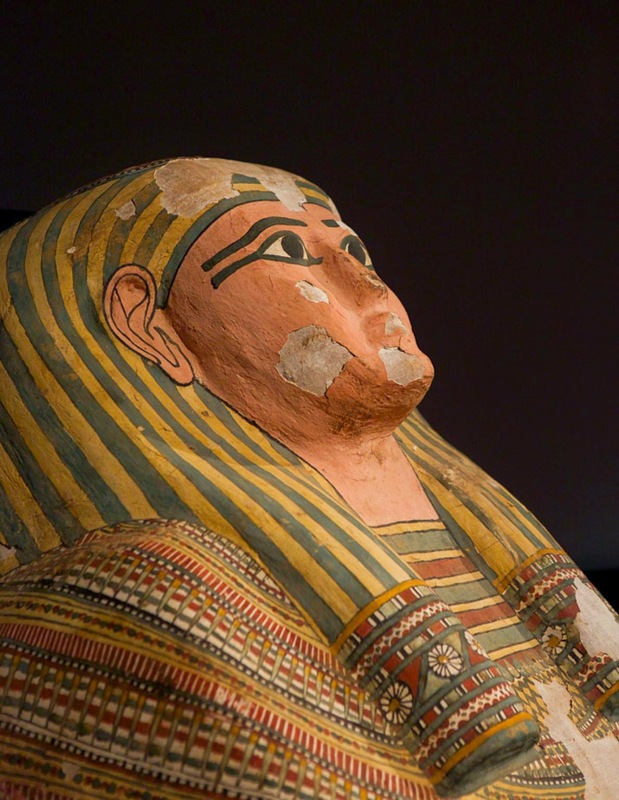 The stylized face of Shesepamuntayesher is depicted on her outer coffin. 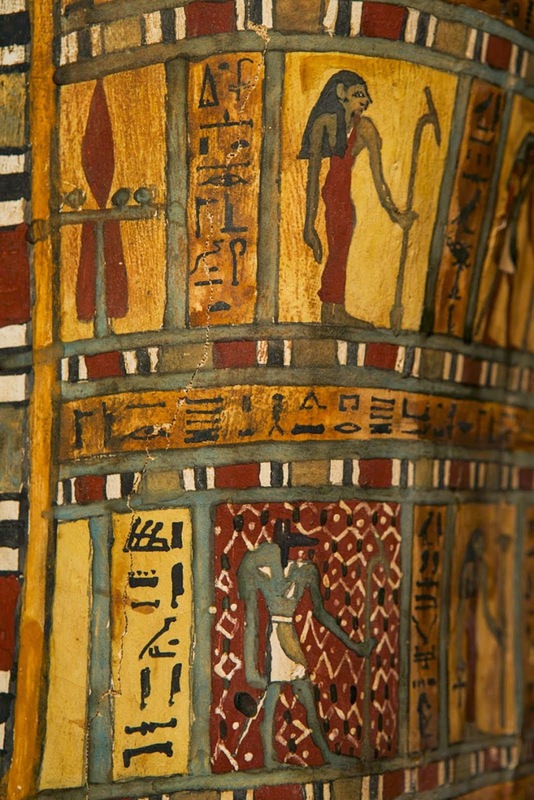 The coffins are decorated with gods and goddesses of the Egyptian pantheon. 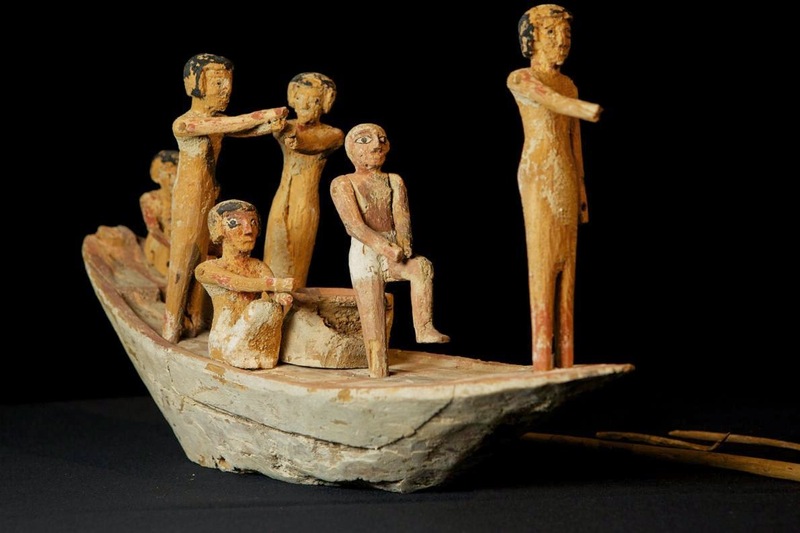 A 4,000-year-old boat model is one of three being returned to Egypt. This Greco-Roman style Egyptian sarcophagus is one of more than 100 objects being repatriated. More on King Khaba discovery at Quesna. Al Bawaba: Why does the date of Easter change?